With many SUV now being able to be labeled as “crossovers,” they are becoming more economical. This doesn’t necessarily mean that they are more affordable, just easier on your wallet in the long run. When you speak of affordable, you’re speaking of the purchase price. What is it going to cost me right here and now? Well, there are some SUV out there that can not only be considered affordable, but they can be considered pretty good bargains for their reliability and diversity. Let’s see what the researchers at Car and Driver, Consumer Reports, Edmunds, and Motor Trend have to say are the best affordable SUV of the 2011 model year. Crossovers have become the new standard in affordability for SUVs, and the RAV4 is leading the way. Its 2.5L four-cylinder engine gives a very decent fuel economy at 22/28 mpg (city/highway). For those who yearn for a little more power from their SUV, the available 3.5L V6 will up towing capacity to 3,500 pounds properly equipped. Four-wheel drive is also an available option. The RAV4 boasts an impressive 73 cubic feet of max cargo capacity, and the vehicle is lined with optional convenience features like the heated mirrors, hill-start assist, keyless entry, and full power accessories. Throw in one of the best reputations for reliability and you’ve got your leader. The Sorento boasts both the best price and the best warranty of all SUVs in this class. For its sub-$20K price, you’ll get a standard 5-year/60,000-mile manufacturer’s bumper-to-bumper warranty. That warranty will cover a vehicle that offers an impressively quiet ride, confident handling, and cargo space that is comparable with industry leaders at 72.5 cubic feet. The base 2.4L four-cylinder engine is a little weak and displays some minor issues when needing to haul extra passengers and cargo. However, the 3.5L V6 is plenty capable and boasts an impressive fuel efficiency for a V6 at 20/26 mpg. The interior displays quality materials and comfortable seating. Were it not for the elevated price with no available engine upgrade, the CR-V would be at the top of this list. The 2.4L four-cylinder engine is your only choice in this Honda, and even with AWD it can be a bit on the slow end. 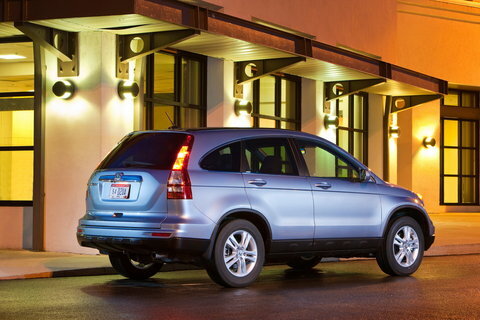 “Nevertheless, the CR-V sets itself apart with relatively nimble handling and sharp steering. Even braking is quite good, which is unusual for a Honda.” (www.edmunds.com) Its 73 cubic feet of cargo space is on par with other models in its class, and the split-level cargo area is a very nice family-oriented convenience. Excessive road noise is the one drawback to the CR-V, but the optional seven-speaker stereo with subwoofer should help to drown that out. 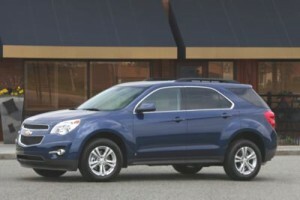 “The 2011 Chevy Equinox is a stylish and comfortable entry in the highly competitive small-crossover segment. RAV4 and CR-V shoppers should take notice.” (www.edmunds.com) Acceleration from the 2.4L four-cylinder engine is actually quite good, but Chevy throws in an optional 3.0L V6 for those who need a little extra giddy-up. The four-cylinder with front-wheel drive will garnish 22/32 mpg at the pump, but the V6 will drop that to 17/25 mpg. Despite the enhanced driving experience offered from the Equinox, cargo space is well below class leaders at 63.7 cubic feet. It also comes in slightly higher at the MSRP table, which puts it at the bottom of the list. 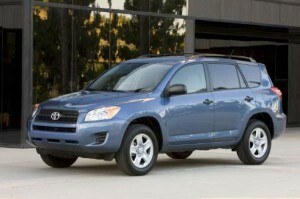 But it does still make the list as a very affordable, quality SUV option.